Windows 10 has been around for over 2 years now and Microsoft is extremely determined towards making sure that they deliver the best experience to their users. Not only did they make the release free for all users for the first year, they have also been very prompt with updating their OS with new features every now and then. On the occasion of 1 year anniversary of the release of Windows 10, Microsoft released the Anniversary Update packed with features and enhancement. The Anniversary Update was focused towards bringing ink support to Windows and it wasn’t just about giving the users ability to scribble over stuff, it was packed with power. Right after the release of Anniversary Update, the Redstone 2 update was rumored and Microsoft made the news official and announced the next major update to their platform. This update is being called the Creator’s Update and it has a bunch of big features which will be targeted towards Creators and people who build things using Windows. 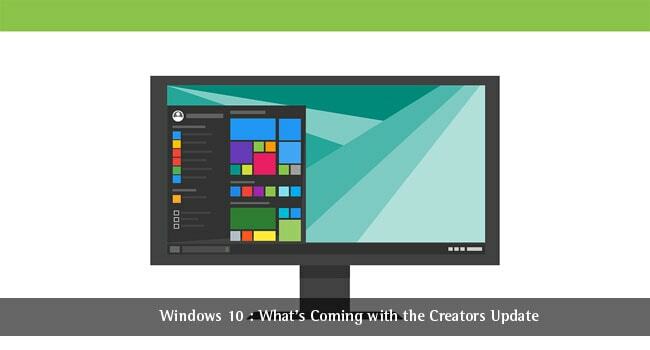 This article is going to cover what’s upcoming in future for Windows 10 with Creators Update. Raise your hands if you have ever faced storage troubles on your computer. I have and it’s really a hassle to decide what to delete and what not to when it comes freeing up the storage. It’s generally better to delegate it to a program to decide what has to be deleted. 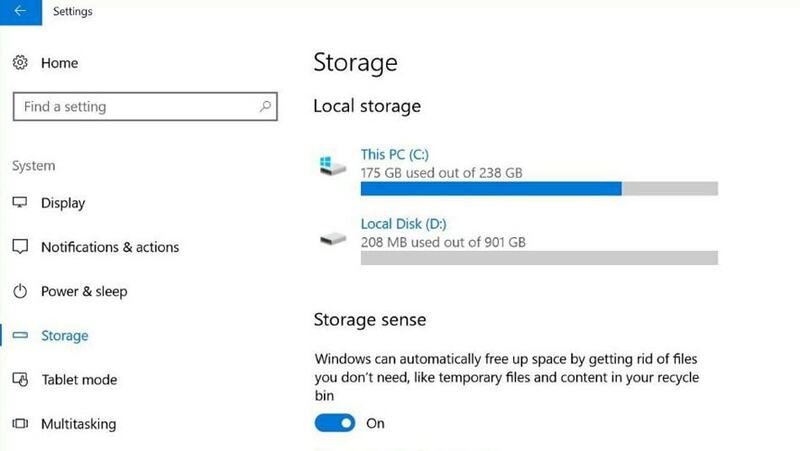 With the Creators Update, you’ll get to do exactly that with Storage Sense. In the new update, you’ll be able to find that under Settings > System > Storage. Once you turn it on, Windows will automatically delete unused temporary files as well as your Recycle Bin content. Most people may call this one a gimmick instead of something that would actually be helpful, but I still think it’s kind of cool that Microsoft has built something like this into Windows. And believe me when I say this, post-launch, this will be one of the things you’ll be seeing the most on Windows 10. With the Creators Update, you will be able to send emojis to your contact, but wait, they aren’t your typical everyday emojis. They’re 3D stickers like things which will come to life right above the avatar of the person who sent it. It’s needless to say that this will be working in sort of a relay with Skype. One of the worst things about Windows 10 has been automatic updates. Users have no control over when they are downloaded. At the most, you can only defer these updates, or try out a registry hack to gain some control over it. While hacks and tricks will always be there, they’re generally not the go to option for everyone. Well, you can finally calm down if Windows just drained away your data cap, because with the Creators Update you’ll be able to pause the Update for up to 35 days (still not a full blown solution but it’s still better than nothing). You’ll be able to do so by heading over the Settings app, clicking on Updates & Security then Windows Updates and then clicking on Advanced options where you’ll find the Pause Updates toggle. Do note that Windows Defender and other critical updates will still continue to install automatically. 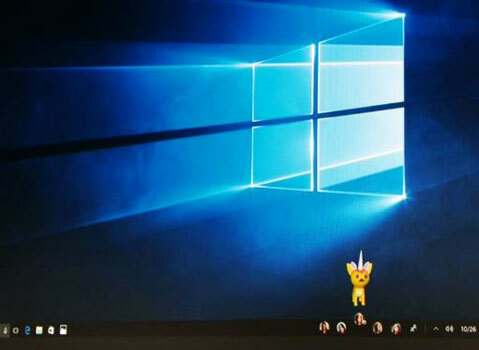 Gaming is one of the things where Windows shines when compared to other platforms. And over the years, Microsoft has doubled down on their commitment towards delivering whatever the gaming community asks for. In recent years, game broadcasting has become one of the most popular spectator sports. With the rise of Twitch and YouTube Gaming, this genre of live streaming is here to say. This is why Microsoft is also getting on board with the idea. 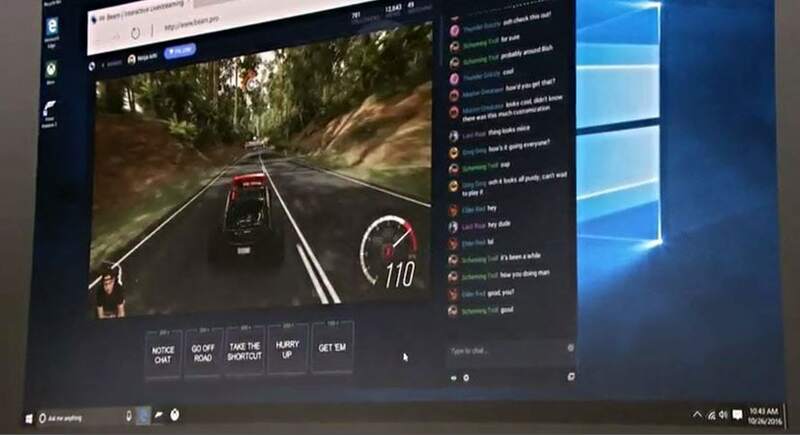 With the Creators Update, gamers will be able to stream games in 4K with Beam from their Windows devices including Xbox. In addition to having the ability to stream games in high-resolution 4K. 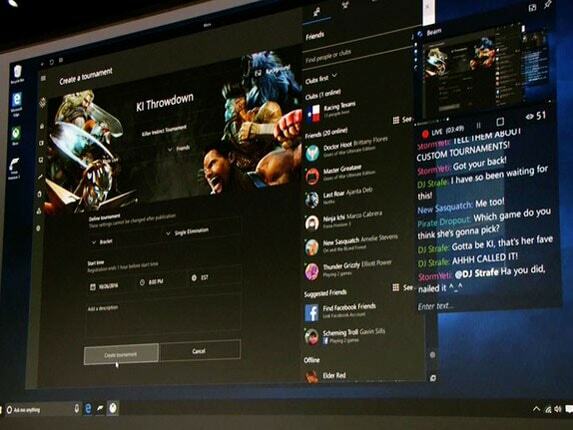 Microsoft is also making sure that users experience the best performance while playing games. This isn’t just going to be applicable for games you install via the Windows Store, any game that you install yourself will also receive this added performance push. How you ask? The Creators Update will come with an inbuilt Game Mode which will throttle the performance of the system when you launch a game. 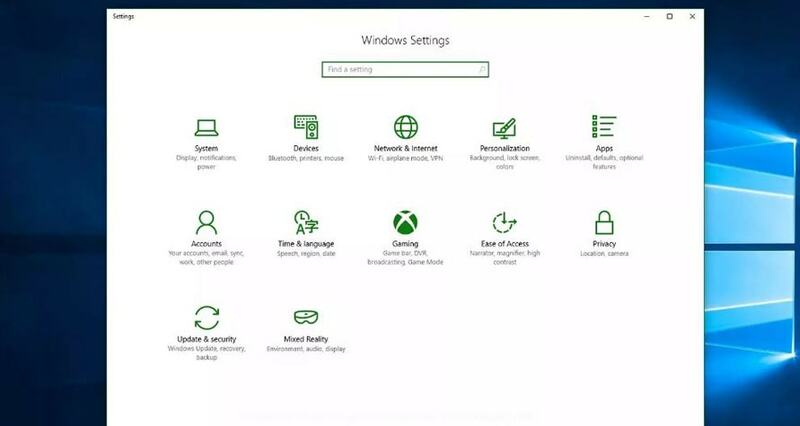 This has already started showing up in the Insider Builds under a separate Settings option in the Settings App. It’s important to mention that the new Vulkan APIs will also increase the performance up a notch. So basically, the Creators Update is going to be a treat for all you gamers out there. 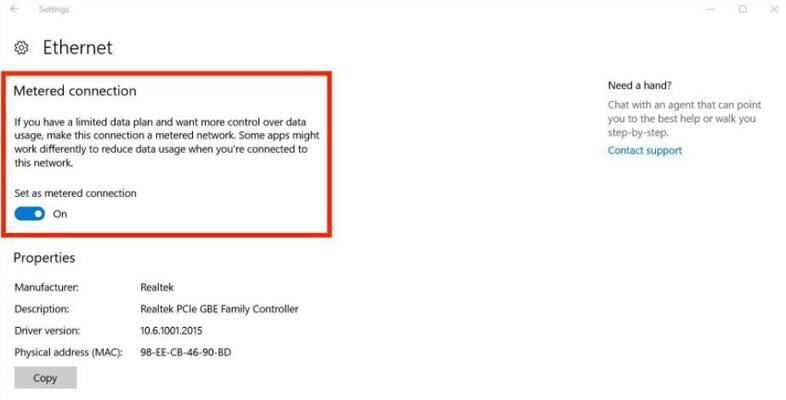 Currently, if you are on the Anniversary Update of Windows 10, or even an older version, you can mark the networks you connect to as metered. What this means is if you are using a network which has a data cap like your cellular connection or even a mobile hotspot, you can make sure that Windows won’t start hogging down your data cap by downloading updates. As of now, this was only available as an option for cellular connections and mobile hotspot. But what if you are connected via a physical Ethernet cable? Not to worry, the Creators Update adds that as an option as well under the same settings. Head over to Settings the click on Network & Internet then go to Ethernet and click on your Ethernet connection and you’ll find the Set as a metered connection toggle. Almost every major platform (Android, iOS) has implemented this one feature in some way or the other, and when they hadn’t, there were third party apps which allowed you to do so. Research says that after sunset if your eyes are exposed to blue light, it’s difficult for you to fall asleep. To aid users with this problem, developers started building apps to filter out the blue light for those who are nocturnal beings. Apple has it in their Night Shift settings and Android is so bloated at times, it’s built right into the system. Windows lovers you’re not being left behind. With the Creators Update, you’ll be getting control over the blue light troubles via a special setting. 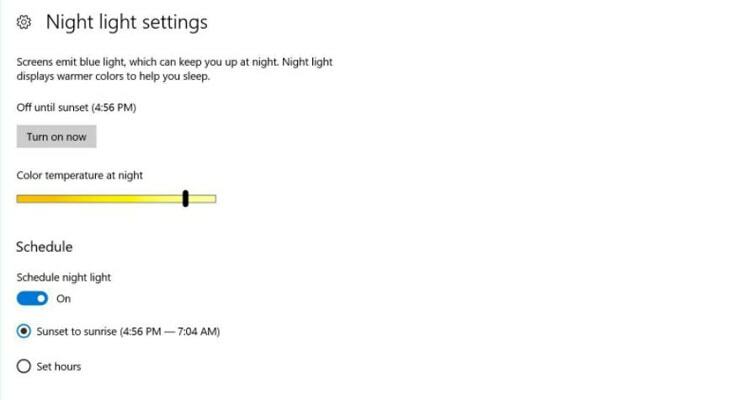 Under the System option in the Settings app, go to Display and then click on Night light settings. You’ll be able to schedule it to turn on at sunset or add specific hours that it stays on. Just to make this easy, you’ll also have a new Night light button in the Action Center to toggle this on or off. I’m sorry if I’m being biased towards gamers here but this one is pretty significant for the gaming community. On platforms like Steam, one of the most loved features is the ability to start a tournament with your friends. Well, PC users can rejoice as this well-awaited feature is coming to Windows 10 with the Creators Update. This will be available within Xbox Live. The app will allow users to start their own custom tournaments so they can compete with their friends. It will also keep score and run a bracket. If you own a 4K display, you may have had this awful experience of apps looking blurry because the developer hasn’t updated the app to run on a screen with such high resolution. On Android, with Nougat you are able to change the DPI (dots per inch) under the Settings app. The same feature will make its debut on Windows 10 with the Creators Update. The update will ask a way to override DPI settings so that individual apps can scale of properly. This is great as this won’t be a system-wide override. To enable this just right click on the app and go to Properties. 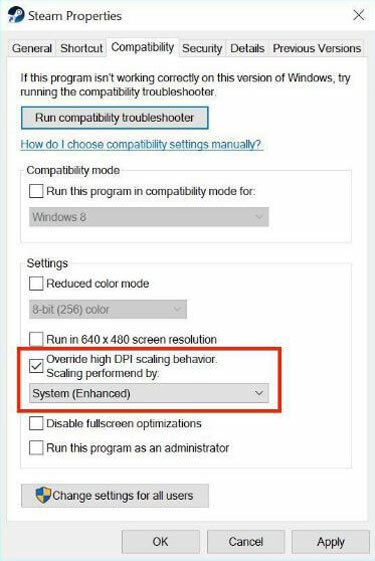 Click on the Compatibility tab and check the box for Override high DPI scaling behavior and then choose System(Enhanced) from the drop down. Again, this is more of a UX improvement instead of being a feature addition. Currently, if you hit the share button in an app, the sharing option comes in from the right which is like a Windows 8 thing (stop being lazy Microsoft designers, seriously). This is a huge UX problem because you now need to move your pointer to the right, where the option popped up(unless you’re using a touch-enabled device). Trust me when I say that it is a big deal. Anyways, this gets fixed with the Creators Update. If you now click on share, the Share menu (new) will come up right on your click target so no more extra swipes. 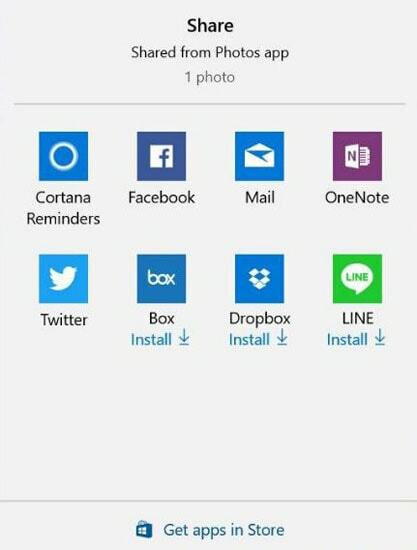 The new share option contains the usual Facebook, Mail etc and also contains suggestions for other apps. The features and enhancement I have discussed above, clearly shows that the new update coming to Windows 10 is geared towards creative professionals. Well, if you are just an average user who doesn’t need all these bell and whistles meant for power users, hold tight because there are features meant to delight you as well. We’ll be covering more on the Creators Update once the public rollout begins. I am actually delighted to read this blog posts which consists of lots of Useful Facts. Thanks for sharing us.